“Way too early to be typing a post, but this interesting thought occurred to me late last night before I went to bed. As most Americans are still pretty much clueless on avian influenza and potential pandemic, distracted by other minor issues in the country (economics, politics, et al. ), it will be really interesting to witness the general public’s reaction once H5N1 arrives. I’m not referring to a human-to-human variety, just the common pathogenic bird strain. As we have seen in other countries, mass die-offs of diseased poultry, culling and ‘exclusion zones’ around infected areas tend to be reported into at least the local news.Bear with me as I explore the scenario a bit. Perhaps H5N1 is found in a poultry farm, say in California, wiping out 90% of the flock. The rest are culled of course. A quarantine perimeter is set up around the infection site and MSM reports about it a bit. Two days later, three more farms report mass die off of birds. Gets a little more attention than before. Appropriate government officials give assurances that all is well and under control (or some other such drivel). But the public begins to awaken with the news. Wonder where the tipping point is when John and Jane Q. Public senses that there is now a REAL problem? They browse a few sites on ‘bird flu’ and to their amazement discover there are thousands of articles, forums and preparation sites dealing with pandemic / disaster preparedness. The first inkling hits home that this could become a human flu issue, with a few million deaths resulting. So the reaction, I would assume, is to grab up ‘survival’ supplies NOW, hit websites like PFI for quick fixes of information, stop buying poultry products and be very angry that nobody told them. And all this before a human pandemic becomes a reality. If we are lucky enough to have poultry die-offs first in the US, I think John & Jane will be prepping like mad and serious questions will be asked of the government by the people. This summary provides an updated report of seasonal influenza activity for weeks 28-29. It does not include reports of avian influenza in humans, which are available at the avian influenza page. During weeks 28-29, the level of overall influenza activity in the world increased. In the southern hemisphere, a considerable increase in both influenza activity and detection of influenza viruses was observed. Influenza A (H1), A(H3) and influenza B circulated. Widespread outbreaks were reported in New Zealand and South Africa. Countries in the northern hemisphere reported sporadic or no activity. Argentina. Regional influenza activity was reported. Mostly influenza A viruses were detected and influenza B also circulated. China, Hong Kong Special Administrative Region. Increase in influenza activity continued, with circulation of A (H3) and A (H1) viruses. All viruses detected from influenza B were of B/Yamagata lineage. New Zealand. Widespread influenza activity was reported, with mostly influenza A (H3) viruses circulating. Influenza B viruses were also detected. South Africa. Widespread influenza activity was reported. Influenza A viruses predominated. Influenza A(H1) virus circulated. Regarding Influenza B, viruses from B/Yamagata lineage and B-Victoria lineage were detected. Between weeks 28 and 29, sporadic influenza activity was detected in Canada (A), Chile (A, B), Panama (A, B), Poland (B), and Uruguay (A ,B). Brazil and Sri Lanka reported sporadic influenza activity, but no influenza cases were laboratory confirmed. Cameroon, Estonia, Germany, the Islamic Republic of Iran, Mexico, Mongolia, Oman, Portugal, and Slovenia reported no influenza activity. Austrailia has been having a severe flu season, with no flu surveilance since July 4, 08. No mention of it in the news, no mention to citizens to get their flu shots. Nothing. So what gives? Indonesian and China`s Health Ministers respectively Siti Fadila Supari and Chen Zhu signed Minutes of the Meeting prior to signing a Memorandum of Understanding about bilateral cooperation in the healthcare sector. The signing function which was among others attended by Mohamad Oemar, deputy head of Indonesian representative in Beijing, took place at the Chinese Ministry of Health in Beijing on Monday. “The signing constitutes an initial step of the bilateral healthcare cooperation which will be followed by the signing of an MoU,” Minister Supari said, adding that a further step of the cooperation would cover political and economic health affairs. Before signing the Minutes of the Meeting, the two health ministers who were accompanied by their delegation exchanged views on health problems in the respective country. “Bird Flu cases apart from the bilateral cooperation become a hot issue during the exchange of views,” Supari said. “We hope the health sector cooperation between Indonesia and China can be stepped up considering that each country has the same problem of diseases like the bird flu,” she said. Meanwhile, China`s Health Minister Chen Zhu said his government hailed Indonesia`s wish to establish health cooperation including exchange of information. Chen Zhu said further that China had encouraged Indonesia to conduct research and development of the health sector, for instance on bird flu. Image of the Health Ministers CO-OPERATION, Health Minister Siti Fadilah Supari shook hands withHealth Ministers China Chen Zhu after signing Minute of Meeting in Beijing, China, yesterday. This signing as preparations for the health co-operation of the two countries. Beijing (SINDO) – Health Minister (Menkes) Siti Fadilah Supari said, the Indonesian vaccine industry at this time increasingly advanced. Moreover Menkes considered the domestic vaccine could have been equated and competed with the vaccine that was produced by China. ”Dari the aspect of the progress of the vaccine industry and the product that were produced, of Indonesia has been enough to advance with the similar industry in China. Moreover could be said a little maju,” Menkes Siti Fadilah words after the signing of Minutes of Meeting with Health Minister China Chen Zhu in Beijing yesterday. Health Minister Siti Fadilah gave an example, the Indonesian pharmacy company, Bio Farma, was one of the 500 vaccine companies in the world that was acknowledged by the Organisation of the Health of the World (WHO). Indonesia, he said, be prepared and asked China to carry out the co-operation of vaccination research and development for various illness kinds like bird flu. In the meantime the BPOM Husniah Rubiana Akib Head when visiting the China Sinovac vaccine factory before this agenda said, Indonesia actually did not lose to the progress of the vaccine industry in China. ”Bahkan we had several superiority like already the Bio Farma entry in the list of the good vaccine company by WHO,” he said. Manager Business Internasional and Investment Relations Sinovac Helen G Yang said, his company uptil now produced the vaccine for hepatitis of A,hepatitis B, the SARS vaccine, as well as bird flu. ”We received the full support from the China Government to produce various vaccine kinds that were distributed all through the territory in China. We in fact received the fund support from the government,” flat him. On the other hand, the agreement agreement between the Indonesian Government and China was the step in early before the signing of the text kesepahaman (MoU) concerning the co-operation of the health field. The co-operation that will be developed by the two countries included health politics and health economics. This is by monotreme, of PFI. Thinking the unthinkable in the 21st century: Who would use influenza as a biological weapon? There have been occasional speculations in Flublogia as to whether H5N1 could have been some how manipulated by man. When this has been discussed in Flublogia, the idea has often been dismissed as fear-mongering by conspiracy theorists. However, when the Minister of Health of Indonesia, Siti Fadilah Supari, suggested that the US would use Indonesian samples of H5N1 to create a biological weapon, the response from the public health establishment was muted. Prominent members of this group, such as Dr. Nabarro (UN panflu czar) continue to go to meetings with her. Dr. Supari retains her position as a member of the executive board of the WHO. Given that the charge has been made that H5N1 may be used as biological weapon by a prominent member of the international public health community, and that she is still apparently a member of this community in good standing, it is worth considering whether influenza could be used as a biological weapon and which country is most likely to employ it in this way. One caveat at the outset: I am not a military strategist, so take all my statements about military thinking with a large grain of salt. When talking about weapons, it is important to distinguish between tactical and strategic weapons. Tactical weapons are used to win specific battles and are narrowly focused. For example, an air-to-air missile used to destroy another fighter jet is a tactical weapon. Strategic weapons have broader applications, such as to destroy an enemy country’s ability and/or willingness to fight. The two atomic bombs dropped on Japan were used as strategic weapons. Biological agents make poor tactical weapons. They are hard to target to specific people such as enemy combatants and, if they are highly infectious, likely to trigger epidemics in off-target populations which may multiply the number of enemies the user of such a weapon has to deal with. So, imo, influenza is unlikely to be used as a tactical weapon. The use of biological weapons as strategic weapons is far more likely, imo. For example, there is great concern that anthrax or smallpox might be used as terrorist weapons. Although both of these agents have the potential to kill large numbers of people, anthrax can be treated with antibiotics and there is a vaccine for smallpox. Further, the use of either of these agents would likely provoke a very strong response, possibly including nuclear retaliation. Finally, such an attack would inspire revulsion on the part of most of the world and would likely multiply the number of enemies the user of such agents had to deal with. So, although attacks with anthrax or smallpox by irrational terrorists is possible, it is unlikely that any nation-state with a rational leader would employ such weapons. Influenza is a naturally occurring pathogen that almost everyone is familiar with. As a result, it might not be obvious that a manipulated form was being used in an attack (Sydney Morning Herald, Madjid et al. 2003). Thus, it could be used surreptitiously, possibly without risk of detection by either the target or the world at large. And as we know only too well, influenza can be extremely deadly and resistant to any treatment. Given that the manipulators of the virus would have detailed knowledge of its antigenic properties, vaccines could be developed which could be tested ahead of time (Krug, 2003). Members of the attacking country’s military and the civilians it wanted to survive could be vaccinated before the manipulated strain was unleashed. Some members of the attacking country’s population could be left unvaccinated in order to maintain plausible deniability that it played any role in what would be called a natural catastrophe. Who would have the capability and the motivation to launch an attack with a highly virulent influenza virus? Although terrorists immediately come to mind, I think they are unlikely suspects. First, they lack the technical sophistication necessary to design a flu virus and a vaccine against it. Second, they lack a motive. Although such a virus would accomplish their goal of killing a lot of people and disrupting the world economic system, the countries from which the terrorists come are not self-sufficient in food or medicine and are likely to be depopulated in the event of a high CFR pandemic. Thus, I believe that the most likely source of an influenza biological weapon is an established nation state. Imo, three countries have the necessary technical expertise to use influenza as a biological weapon: the United States, Russia and China. I will consider the evidence and likely motives of each of these countries in turn. 1. The US is the world’s only hyper-power. If the US wants to conquer a country, it can do so with conventional weapons or, if necessary, nuclear weapons. 2. The American people are natural isolationists and have no stomach for empire, even if a particular administration did. Wars must be sold to the American people on the basis of self-defense. They would never agree to the use of biological weapon as an offensive weapon. 3. Given that the US is a free country, it would be very difficult for the government to hide such a program. Although many Americans will agree to keep secrets that they consider lawful, very few would agree to a program of deliberate genocide. I personally have never known an American scientist who would even consider such a possibility. Given that the scientific community is quite small, it seems unlikely that such a morally offensive program could be kept quiet. Russia, in the form of its imperial precursor, the Soviet Union, has a long and extensive background in the development of biological weapons for offensive purposes (Wikipedia). They certainly have the technical expertise to develop influenza as a strategic weapon. Given this country’s recent past as the head of a totalitarian empire and some troubling signals of a slow backslide into an authoritarian regime, it is reasonable to ask if the Russian government has any motivation to launch an attack with manipulated influenza. Imo, the answer is no. 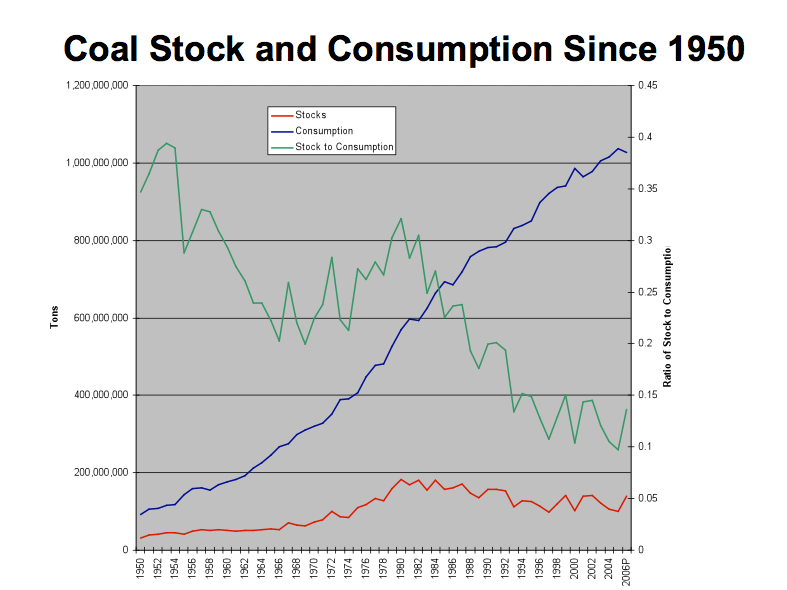 Russia is a weak country with abundant natural resources (US Library of Congress). Although I don’t doubt that Putin dreams of Russian military greatness, disrupting the current ecomomic system will not help him achieve this goal. The petroleum and natural gas reserves he controls are generating large amounts of cash with which he can rebuild the Russian military. So, although Russia may prove a threat in the future, Putin is heavily dependent on the stability of the current world economic system to acheive his long-term goals. A high CFR pandemic flu would leave Russia with no market for its most valuable assets. 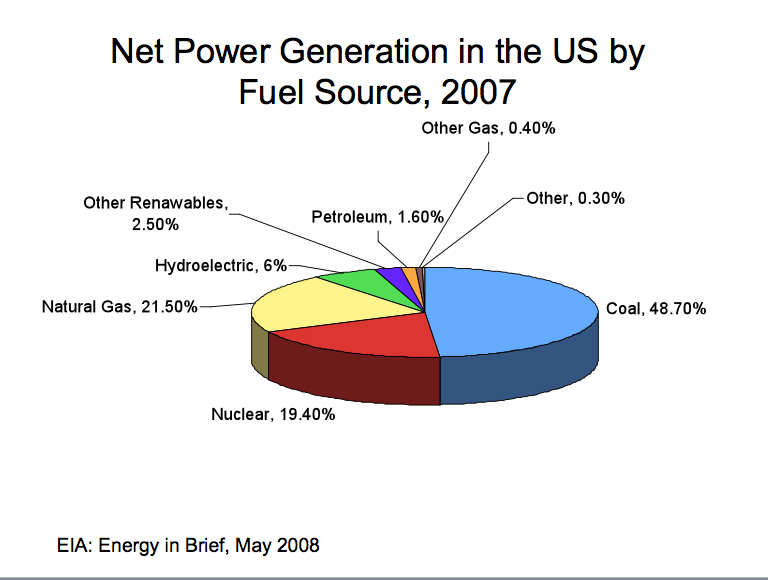 And, given Russia’s own natural resources (and declining population), they have no motive to try to take anyone else’s. Finally, we consider China. At first glance, the Chinese government would seem also to be heavily invested in the current economic system. 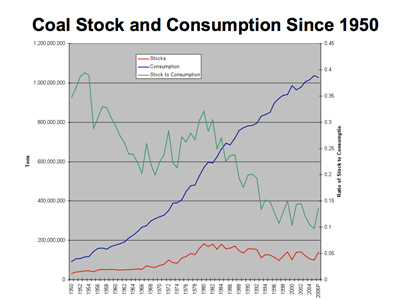 After all, China has gotten very rich from globalisation. However, there are signs that this system of enrichment may be coming to an end. With rising oil prices, transportation of goods from China to the West is becoming increasingly expensive (Econbrowser). Already, some manufacturers are bringing their factories back to the countries where the goods will be sold (YaleGlobal Online). This trend will only increase in the future. At the same time, rising inflation within China is making basic necessities increasingly expensive to the average citizen (NYT). The head-long rush into industrialisation has resulted in the destruction of much of China’s farmland (BBC). China can scarcely afford this as their population continues to expand despite draconian government atttempts at population reduction (Time). Finally, although some Chinese citizens have seen significant improvements in their standard of living, many have not. This has led to peasant revolts in the countryside which are becoming increasingly frightening to Communist Party officials (The Australian, IHT ). Above all things, they fear the fate of the Ceausescus (BBC). How would the Chinese government benefit from a pandemic that appeared to be natural but which was actually engineered by them? First, they could decide who within their own country would be spared and who would die. Troublesome minorities and peasants could be removed while Han Chinese in urban areas might be spared through vaccine and through stockpiles of food and fuel. On a global level, the West would be on its knees and Africa would be decimated. The depopulation of Africa, in particular, might be considered a desirable outcome given that China desperately needs the resources to be found there (BBC). The Middle East would also likely be depopulated and its resources easy pickings for a resurgent China. Some would say that no government would consider such an evil course of action. To those I say, remember the past and pay attention to the present. The Chinese government is actively facilitating genocide in Darfur (NYT). They are strong supporters of Robert Mugabe in Zimbabwe (Zimbabwe Independent). The message is clear for any who wish to read it: the Chinese government wants Africans dead so that they can take their resources. The Chinese military, especially its Navy, is being prepared for Empire building, not an attack on Taiwan (The Atlantic, The Economist). The Chinese people are being indoctrinated with an intolerant, virulent Nationalism with strong racialist components (CFR , The China Expat , NYT). We have seen these signs before. We should know what they mean. …a “criminal in the WHO” who sent samples or data to the US government’s secretive research laboratory at Los Alamos, New Mexico, was “terminated”. To this day, she has not denied making this statement. If the Chinese government was concerned that their role in creating a pandemic strain would be revealed, what better way to deflect blame than to use their puppet at the WHO to, behind closed doors, accuse the US of the very crime it had committed. After all, everyone trusts the WHO, right? Oh, and one more thing. For those who are tempted to dismiss this post as a fanciful conspiracy theory, ask a flu virologist where the 1977 H1N1 epidemic came from. Many virologists now believe that it was literally just that: an influenza virus from the 1950’s, stored in a laboratory freezer at a research facility in China, somehow got released into the environment in 1977. There’s an old saying: “Where there is smoke, there is fire.” This isn’t always true. Sometimes, there’s just smoke. But sometimes there really is fire. I can’t prove that the Chinese government has engineered or plans to engineer a pandemic, but I think this possibility should be considered more seriously than it has been. There is smoke in China. Qingdao (AP) – The Chinese Olympic organizers have announced their closure of the Olympic coalfield undone and for any inconvenience to the national sailing associations excused. The closure was on Monday afternoon for Tuesday morning (8.00 clock time) have been announced, but still in the night of Tuesday with an apology of the organizing committee (BOCOG) has been repealed. As the BOCOG said it had alleged in the warrant on Monday is an error traded. An e-mail content was mistakenly corresponding to the national sailing associations have been sent. The process is now up and a second notification to the associations already gone. At the German sailors Federation (DSV), the appropriate apology on Tuesday morning – to clock 4.04 – by e-mail. Sailing, the assets but not. Both asset and Yngling spokeswoman tax Ulrike Schuemann (Berlin) and Tornado helmsman Johannes Polgar (Danish-Nienhof) reported dense fog. The Visibility currently amounts to less than ten meters, said Polgar. If you check this link out, it’s in German and needs a translation. There is speculation that this is just for a day. As far as this being an menigitis outbreak/epidemic, it’s still hasn’t been confirmed. The persistant sypmtoms is still multi organ involvement(liver and kidneys), difficulty breathing and flu like symptoms. I take it these people are sailors and have a boat there. Some people are trying to fit the algae into this making people sick.I don’t believe it is. This illness is a disease striking thousands of people. The orginal chineese paper states 160,000 people infected. The translation machine says 16 million. We all know that isn’t possible, and further more, it would be all over the news, and we’d be infected by now. The Chineese government has a very tight censorship on the news. The Olympics are the main priority at this moment. They are not going to let anything shadow this. This is either the flu(which strain?) or SARS all over again. So, if anyone has any news please let us know. July 12, the Qingdao municipal government organized the city’s Health Bureau, the Centers for Disease Control study of the staff held meetings, first proposed at the infectious diseases as suspected epidemic cerebrospinal meningitis (ECM) infection. In order to ensure that the upcoming Olympic Games sailing competition will not be affected by the epidemic, the meeting will be clear by the disease outbreak as a top-secret Miji be kept confidential, and urged all levels of health care units to patients with strict confidentiality, to take all possible measures of Isolate patients, in addition to the tight, loose, still insist that the external pandemic flu. According to the medical profession concerned said that the ECM was caused by meningococcus of suppurative inflammation, has strong infectious, the annual winter and spring, the incidence of meningitis can be acute bacterial sexually transmitted diseases account for the first. ECM three susceptible population are children, the elderly and migrant workers. First of all invasive meningococcal respiratory tract, patients on the first day of the onset of a similar upper respiratory tract infection symptoms like fever, stuffy nose and a slight cough. To the first 2-3 days, pathogenic bacteria will soon enter the blood system, destroyed by the enemy of normal human blood cells, the formation of sepsis, leading to infection toxic shock. Shivering in the performance of high fever, looking pale and Jingshenbuzhen, on a plaque or sediment deposition point. Bacteria will be through the blood-brain barrier, into the brain tissue, leading to meningitis, a severe headache, vomiting spray, and even convulsions. That the H5N1 strain of bird flu has not yet caused a pandemic is no cause for complacency. Preparations for the inevitable must be redoubled to mitigate the potential devastation.Five years after the deadly H5N1 avian influenza virus exploded into a global epidemic in birds, it has infected more than 300 people. Happily, it has not yet evolved into a strain that can transmit easily between humans – an event that would trigger a pandemic that could kill tens of millions. But as long as H5N1 continues to be present in animals, that risk persists. And with so many other flu strains out in the world, all constantly evolving, a flu pandemic is inevitable. Senator Obama has said that preventing an avian flu pandemic is one of his national security priorities. He refers to his work with other Senators to provide $4 billion to the Centers for Disease Control to combat avian flu and to build a stockpile of antiviral drugs that had been in short supply. Pandemics and Biosecurity. Some estimates suggest that if H5N1 Avian Flu becomes a pandemic it could kill more than 300 million people. In an era of constant and rapid international travel, what steps should the United States take to protect our population from global pandemics or deliberate biological attacks? So taking stock years after the President’s National Response Plan was published (November, 2005), after the cable media hype died down and after billions of federal, state and local dollars and man-hours (and quite a few diaries here at Daily Kos), it’s worth a re-assessment of where we are at (for comparison, see 2005’s Council on Foreign Relations: Pandemic Flu And Where We Stand. )Declan Butler, Nature‘s senior science reporter has a terrific Q&A this week on the H5N1 topic, entitled whatever happened to bird flu?. Bottom line: we can’t get rid of it in poultry in Southeast Asia (and Egypt and other places in Africa) so it sits there smoldering, waiting to infect humans, and waiting to potentially mutate to make it easier to catch. H5N1 remains a risk to humans. And are we prepared? Not so much. Like hurricanes, pandemics can’t be predicted. We don’t know when the next category 5 storm will hit and where, but the inevitability of severe weather is matched by the inevitability of flu pandemics. 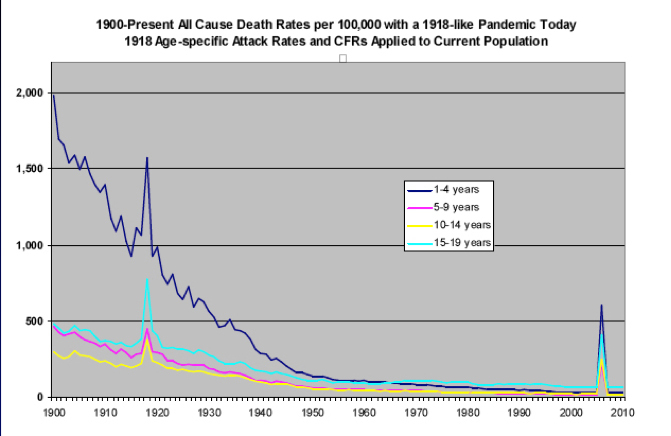 As we all now know, there were three in the last century (1918, 1957 and 1968) and the 1918 pandemic was truly devastating. 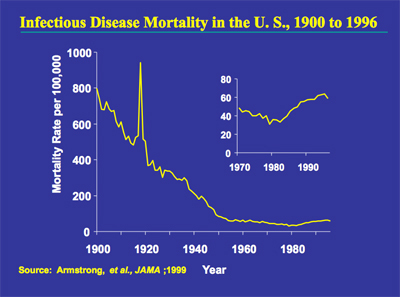 Note the spike in mortality representing the 1918 pandemic. For that reason (mortality, and especially child mortality), the mitigating efforts of public health and national security agencies have taken place. Our vulnerabilities are not so obvious, but our inter-related world and Just-in-Time economy contribute to our lack of resilience. For example, last week, I wrote about the price of oil and natural gas contributing to the price of latex exam gloves as an example of the nail-shoe-horse-kingdom chain of events that impacts on the cost of health care (and why it is not easy to rein in – see Health Reform: An Integrated Problem In An Integrated World), but the critical supply chain for food and goods is just as relevant for pandemic discusssions, as is our fragile electrical grid. 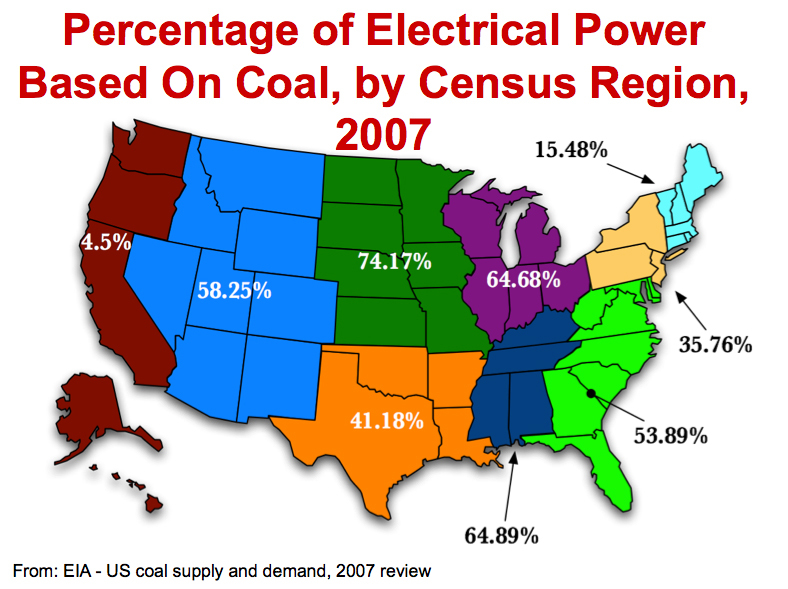 The following pics come from Michael Osterholm at CIDRAP, U of Minnesota, and outlines the regional dependence of electricity on coal. Our coal inventories are dangerously low (in terms of potential interruptions) Imagine if the folks who run the coal trains (and the mines) become ill. This is why posts like 2007’s Flu Stories: Is the Internet At Risk In A Pandemic? are relevant. 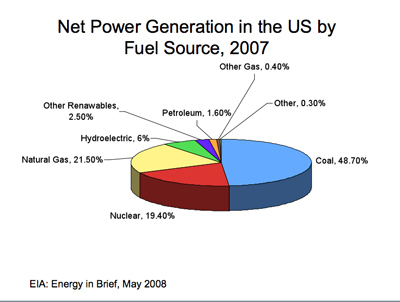 So are energy stories, particularly when placed against the backdrop of worldwide food price hikes and potential and actual food shortages. Whether it’s rebuilding public health infrastructure, or including public health in health reform, or understanding the integrated just-in-time way of life we lead and protecting that as well, preparing for a pandemic will help us cope with whatever comes next. It’d be nice to know just what that ‘something’ is, but we’re not always that lucky. Ask the folks in New Orleans whether more preparation time should have been spent, and whether we are spending enough time worrying about natural disasters now. Earplugs — the Plague of bird flu (Avian Influenza) in Indonesia still continued to be guarded against. 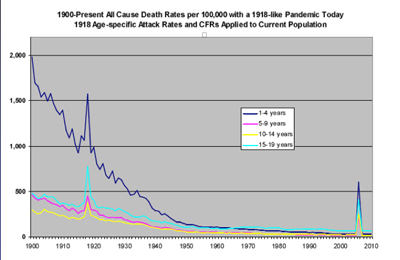 This deadly illness was still having the potential to develop faster than last 2005. Agriculture Minister, Anton Apriyantono, said, this illness must be guarded against, especially during the rain season. His article, the development of the bird flu virus in the rain season was far more aggressive compared with the dry season like at this time. We ‘must continue to be on the alert against this bird flu attack’, said Anton, in gaps of the Penyidikan Hall cornerstone of the Veteriner Testing of the laying agenda (BPPV), in the Village of Werasari Kel Dangdeur Kab Subang, on Thursday (10/7). Anton explained, the plague of the bird flu illness the first time was in Indonesia around 2004. This plague, caused the economic loss in large scale. The following year, said Anton, this bird flu threatened the spirit of humankind. Because, the spreading of his deadly virus not only from the animal to the animal, but already to humankind. In 2005, said Anton, was recorded by approximately 136 people was infected the AI virus, even 110 people among them, his spirit could not be rescued. Since ‘bird flu attacked humankind, then we carried out the research to produce his charm medicine’, he said. It was further that Anton said, because of the fear of the bird flu threat that increasingly raged this, then several researches and the laboratory were developed to produce the dangerous illness charm that was spread by the livestock animal. One of them, with the development of the health laboratory of the animal to avian influenza (AI). Named by Anton, ideally each province in Indonesia had this laboratory. However, said he, because of the limitations of the fund, at this time the AI laboratory available in Indonesia this just totalling eight units. Director General Peternakan Departemen of Agriculture, Cepy Sujana Daradjatun, claimed, the development of the AI laboratory that the laying of his cornerstone was carried out yesterday that was the natural grant from the Japanese community. Jakarta: the Penelitian Veteriner Hall (Balitvet) Bogor, West Java, found the groove (strain) the new bird flu virus in Purwakarta. Peternakan West Java Rachmat Setiadi Section Head said, in accordance with his location, the groove that was suspected of by results of the mutation being acknowledged also as the Purwakarta groove with the specific code strain PWK. Director Kesehatan of the Animal Directorate General Peternakan Departemen of Musny Suatmodjo Agriculture said, strain that was the bird flu virus that had emerged in this territory in 1976. The difference of the protein composition caused the bird flu vaccine that uptil now was used in Indonesia to become ineffective. Despite this, Musny guaranteed the bird flu virus of H5N1 strain Purwakarta not turn off like strain other bird flu. The difference that was specific in the protein composition in strain Purwakarta, according to Musny, happened resulting from the mutation in the virus body personally. the form from H5N1 became the kind H5N2. To map the explanation of the bird flu virus, according to Rachmat, Dinas Peternakan spread out the co-operation with Balitvet. Apart from in Purwakarta, strain same was reported emerged in several other territories. Strain just like that, Musny continued, also to be found in the Sukabumi territory, Subang and Jakarta. As Goju from PFI stated, “specific code strain PWK??? Is this just gonna slip under the radar? Do we get three guesses and the first two don’t count?